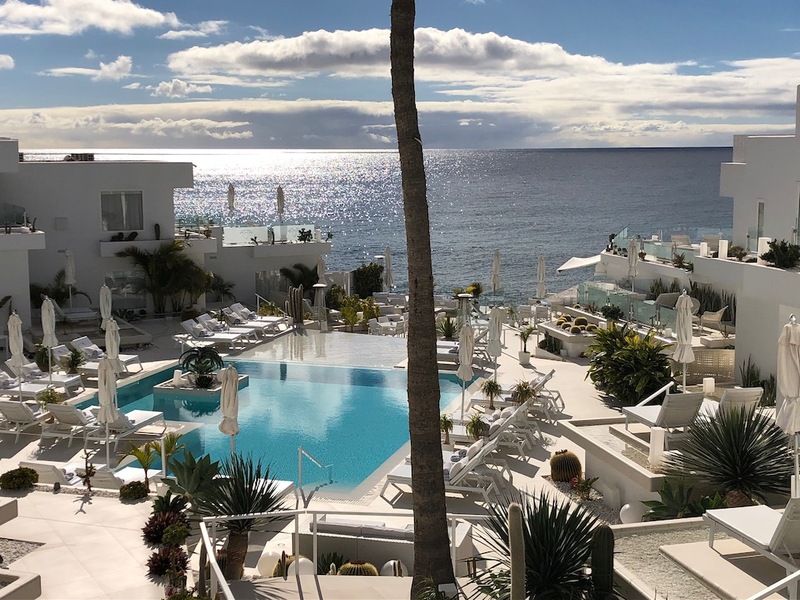 We were right on trend, when we booked a stay at the Lani’s Suites de Luxe to celebrate my 50th birthday, as it had just been voted the world’s most romantic hotel for 2019. This beachfront, adults-only boutique hotel provides a tranquil oasis in the heart of the vibrant holiday resort of Puerto del Carmen in Lanzarote. There are just 25 suites nestled between the Avenida de Las Playas, locally known as “The Strip” and the Atlantic ocean. The suites are built in a U shape around the infinity pool, all facing the ocean. We were staying in the Suite Deluxe Premium (No 17) a unique suite with a large private terrace. The bedroom looked directly over the pool to the ocean, furnished with a king sized bed, we had bathrobes with his and hers croc style slippers, wardrobe including safe, laundry bag, shoe horn, iron & board, an array of pillows and blankets and television with Apple or Netflix channels. This hotel offers a free laundry service with a 24 hour turn around, any items requiring dry cleaning has an extra charge. There are two individual air conditioning units so you can set the temperature for sleeping and living to suit. Our living space also had a direct ocean view, with a small terrace to the front, and a huge terrace to the side. The sofa had a foot stool, cushions and snuggly throws in front of another television. I was pleased to find a selection of organic teas, with teapot and kettle, as well as a Nespresso machine and pods for coffee. We had a fridge full of free soft drinks, together with a wine fridge, alcoholic miniatures and snacks which were very reasonably priced. The thing with Lani’s Suites is all those thoughtful extras, there were two hats and sunglasses, a beach bag, note pad and pen all of which we were encouraged to take home with us. We also made use of the binoculars for watching a pod of dolphins swim past the hotel. Lani’s Suites have embraced modern technology, you have a remote control to change the colour of your light cube, a tablet for internet browsing and contacting the hotel, private wifi access, a blue tooth speaker for playing your tunes etc. The bathroom had a walk rain head shower, a complete range of toiletries, scales and a hair dryer. The piece de resistance with this particular suite is the corner terrace, there were 2 sun loungers with a light cube, sofa, shower, table and chairs, plus our own jacuzzi. We could chose shade or sunshine with an umbrella or sliding awning, it was a heavenly place for a complete chill out. We were treated fabulously throughout our stay, the team of staff are on hand to help when ever you need them, I really don’t think that any request would be too much trouble. We were lucky to find parking in the street opposite the hotel, however you can just pull up to the side of the hotel and someone will park your car for you. They also offer a free airport transfer service. We had a glass of champagne on arrival, and treated to a bottle of Cava on ice with hand made chocolates in our suite, which was perfect for setting the mood to spend a lazy afternoon relaxing on our terrace. Had we preferred to chill out by the pool, there are free soft drinks on hand, as well as a wardrobe with towels and suncream. Each set of sun loungers has a table with a call button, so you don’t have to do anything more than lift a finger, to have your favourite drink personally delivered. The restaurant at Lani’s Suites is ocean fronted, it is open to the public, however their hotel guests obviously take priority. We had opted for their 4 course tasting menu for our first evening and were seated at one of the prime tables by the window. The evening flowed as well as the wine, with friendly and attentive service from start to finish. The canapés complimented the glass of fizz offered on arrival, both of our carpaccios were stunning, Mike chose beef, whilst I had salmon and the orange / lemon flavoured olive oils offered to drizzle over really added something to the dish. We chose 2 different hot starters, I ordered the king prawns, scallops and vegetables in tempura batter with teriyaki dipping sauce, whilst Mike had grilled sea scallops with saffron sauce and salad. The scallops were stunning, so fresh and beautifully cooked. The main course, called “Pettings” was a choice of steak or local fish, we both chose the filet steak with foie and oporto sauce. Again the meat was perfectly cooked to your preference and very tasty. Next I was surprised by the staff singing happy birthday to me and a lovely chocolate mousse with crunchy base was delivered to the table complete with a candle. We also chose the fried ice cream with honey as a dessert from the “Kisses” course. We were offered an after dinner drink, with tea or coffee and finally an espresso martini to finish. On returning to our suite, we found a bottle of Cava on ice with balloons, and sprinkles had been arranged as part of our turn down service. A wonderful surprise and delight gift from the team, who had definitely gone above and beyond to ensure my 50th birthday was a memorable evening. Breakfast is served at the restaurant from 8am to 11am, however if you want to sleep in, or just fancy room service, one call and it’s done. After watching the sunrise from our jacuzzi, we went down to the restaurant at 9am, thinking it would be busy, however we were the first guests to arrive! That proves just how relaxing the environment is here. We were offered a choice of tables with a beachfront view, a section of the glass front had been opened to create an alfresco area in the restaurant. The breakfast menu is cooked to order, and you’re encouraged to order a variety of items, whilst sipping a glass of fizz or fresh orange juice. A basket of bread and toast with a selection of jams is brought around at the start. We both ordered cooked breakfast with poached eggs, crispy bacon for me, normal for Mike, I had mushroom and tomato extras, and Mike selected sausage. We finished with a mixed fruit platter which included banana, kiwi, pineapple, orange and papaya all of which were perfectly ripe and prepared for us. It’s easy to understand why Lani’s Suites are reaping the awards, this really is a little bit of heaven to be found in the original holiday resort of Lanzarote. You are enveloped in luxury from the moment you step into the hotel lobby, off The Strip in Puerto del Carmen. We were oblivious to the outside world, for us Lani’s Suites is a sanctuary, a place where we can enjoy some rest, relaxation and pampering, without having to get on a plane.